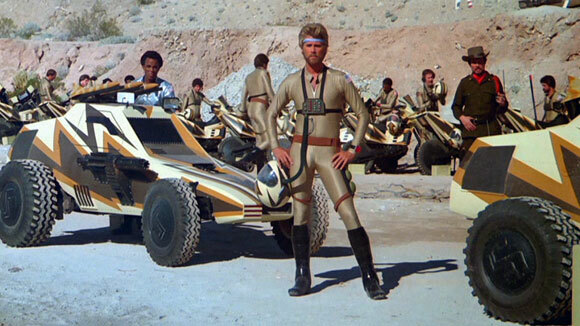 MEGAFORCE —–change the letter ‘O’ in the title to an ‘A’ and you’ll have a one-word summary of this moronic 1982 adventure, burped up by Hal Needham, the director who plopped Smokey And The Bandit 2 and The Cannonball Run onto an undefended population. The force in question is a group of superstudley wiseguys who rove around the globe looking for badmen to quash, finding an outlet here by tackling the ‘usurpers’ led by Henry Silva. Much ballyhoo accompanied this snore, concerning the supposedly amazing hardware used by the heroes, stuff our Army was adopting, but none of it is worth a gawk. Needham’s love of explosions transcends Sam Peckinpah’s fondness for shotguns: alas, no like-embrace of talent trickled down. The stunt man credits here are some of the longest ever scrolled. The costumes were designed by Mattel (yes, this is indeed so). Along with Silva, locked into 99 minutes of infamy are Barry Bostwick, Michael Beck, Persis Khambatta, Edward Mulhare, George Furth, Evan C. Kim and Robert Fuller. $20,000,000 was lavished on this noise, but only one-fourth of it came back. When you’ve seen 25 phony detonations, the 26th is no thrill, let alone the 200th. Director Needham spake: “It’s like no other movie ever made before. And the machines we’ve built are extraordinary. There’s one other thing. Although there’s a lot of action, you don’t see anyone get killed. I think people are beginning to get sick of that kind of thing.” Like hell we are, Hal….pal Hal followed with Stroker Ace. One sad note cropped up when researching this silly sample of 80s nonsense. A former entrant from India in Miss Universe, and most familiar from her role in the first of the Star Trek movies, the stunning Persis Khambatta was plagued by accident and health issues (a scarring car wreck, then coronary-bypass surgery) before succumbing to a heart attack in 1998, only 49.